Get Me Roof's objective is to make property buying experience hassle free for Home Buyers. We are India's first property portal offering Personalized Property Recommendations. We match your location, price, floorplan and other buying preferences with best projects and properties available in the market. Every recommended property on Get Me Roof comes with a Property Score™ - generated as per your preferences. The score lets you relatively understand how good a property is for your investment needs. For instance, a 2 BHK property in a particular project can be rated 9.5 on 10 for you while the same property can be rated 7.3 for another home buyer because of different buying preferences. In addition, every Property Score™ gives you a break up with sub-scores for individual components like Location Score, Price Score, Floorplan Score, Possession Score, Amenity Score etc. This gives you a clear indicator about the property as per your important buying preferences. 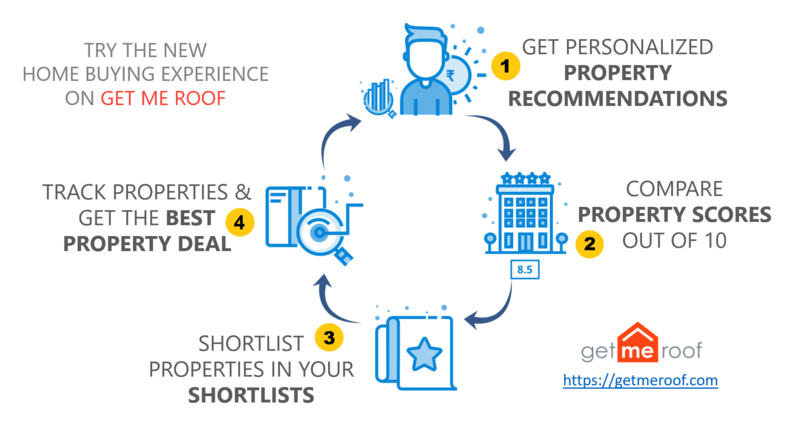 On Get Me Roof, you can shortlist any of the property options available at one or more projects in a common bucket called Shortlists. For example, a 1100 sqft - 2 BHK at Project A and a 1400 sqft - 3 BHK at Project B can sit in your Shortlist bucket for easy reference and comparison. You can also shortlist any of the resale properties into your Shortlists for evaluating best property deal across both primary and secondary markets. Get Me Roof acts as a true Personal Assistant for your Home Buying needs. You can rely on us with your end to end home buying journey. Discover best available properties with our Personalized Property Recommendations, compare Property Scores, shortlist preferred properties, add your personal notes and observations about properties in your Shortlists, negotiate with Builder, Agent, Owners and track your Best Property Deal on Get Me Roof. Write to us at team@getmeroof.com or call us on +91-974-2222-462 with your feedback and suggestions on our offerings and how you would like us to improve.